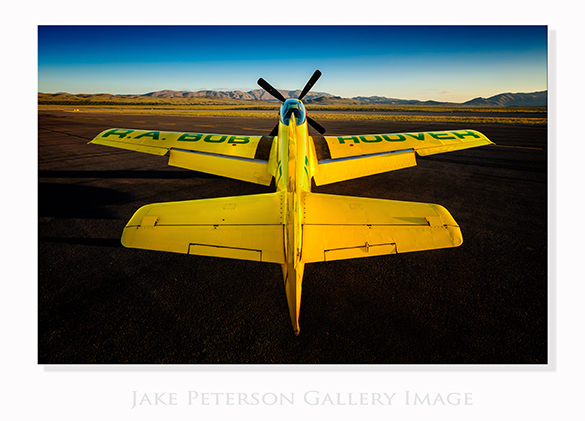 Well as I said earlier I would get back to “Ole Yeller.” I wasn’t sure how the images would turn out considering it was a bright yellow plane in early morning light but I truly can’t complain. When working with an historic subject you really want to do a thorough job because you never know when you might photograph it again. This particular plane is one of Bob Hoover’s planes that he flew doing demonstrations at bases, acrobatics and races. 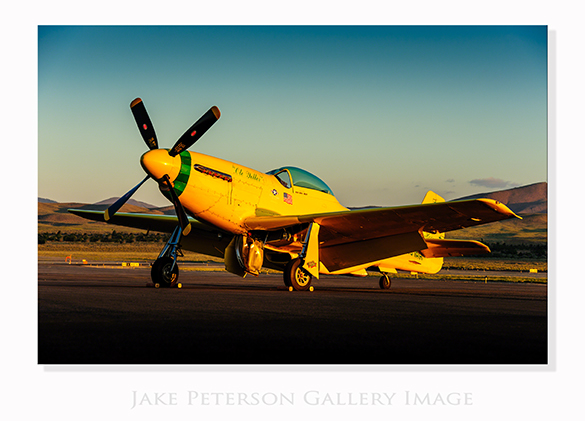 For twenty years it was the pace plane that lead the start of the race for the unlimited class of the Reno Air Races. It was at PRS getting qualified so that it could race again in September. That’s really freakin cool! When it comes to symbolic aircraft, especially mustangs, this one might just take the cake. This plane has a classic race look both forward and backward. One thing that really stands out on Bob Hoover’s planes is his name. In big green letters across the wings are his name, as well as on the tail. Well you can barely see that detail level with the plane let alone photograph it. The only way to get the shot of the wings is from above. With the help of our tug driver that morning, John, we turned the plane around and got up on a latter so that we could see that detail. Now tail shots seem to be last on the priority list when it comes to photographers but it sure can be a powerful shot when down right. I don’t know what it is about the tail, maybe the symmetry of the plane, but something always sets off the true character of the plane.